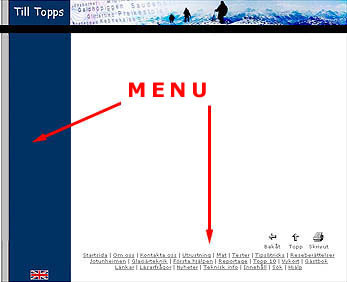 The easiest way to navigate on our site is to use the menu to the left (fig 1). Some of the choices in the left menu will include sub pages, they are marked with a small black triangle. The link that you have choosen is then marked with a red filled box. We have also put links to sub pages at the bottom of every page (fig 2). These are dark blue. If you are reading a long page and don't want to scroll all the way to the top to use the left menu you can instead of that use the menu at the bottom (fig 2). This menu is light grey (compare with the dark blue sub menu). You'll also notice three icons on every page. One for printer friendly format, one for jumping back and one for jumping to the top of the page (fig 3). When you press the print button a new window appears without menues and background colors. From this window you just print the sheet as you usually do. In the travel stories page you see a menu on top of the page where you choose what you like to read about (fig 4). A brief summarize and a map is found under the intro flap. And then under the numbered flaps you read the stories and look at the pictures from the different hiking days. Among with the pictures there's in most cases two icons. These are used for: send the picture as an electronic postcard, to get more information about this particular hiking route (fig 5). In the table below there's an explanation to the different icons and what they are good for. Top - Move to the top of the page. Print - Printer friendly page. More info about the hiking route. Send the picture as an electronic postcard. Link to the English page. Link to the Swedish page. If you still have questions about the page you are welcome to mail us at Till Topps. You reach us easiest by the link "Contact us" in the left menu.